The Derwent Valley between Masson Mill and the Silk Mill in Derby was awarded World Heritage status by UNESCO's World Heritage Committee in December 2001 . 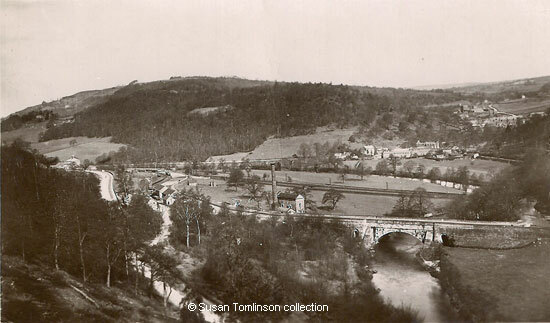 The photograph above, taken in the inter-war years, shows just one small section of the valley to the south of Cromford and includes the old buildings stretching along the Lea Brook to Lea Mills. On the left of the top picture is Derby Road, a section of the A6 connecting Cromford with Whatstandwell. Between the road and the Cromford Canal is the High Peak Junction. 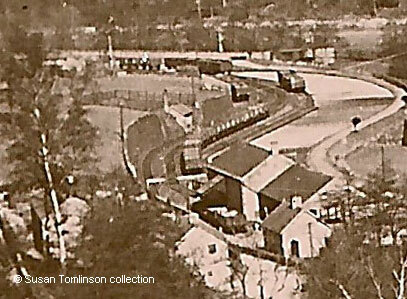 In the enlargement on the left you can see the railway track curve round where it went under the main road before it climbed the hill up to Black Rocks and beyond. In 1880 this was the L.& N.W.R. (Cromford and High Peak Branch) of the Buxton & High Peak Line. Trains have not run for many years from Cromford Junction to Parsley Hay; the railway was dismantled about 1968-9 and today has been developed as the High Peak Trail. The Cromford Canal ran in a south-east direction for 14 miles. Completed before 1794, the canal ran from Cromford to the Erewash canal at Langley Bridge and was said to have cost £80,000. The principal engineer was William Jessop. Peter Davies, writing in 1811, said the first 11 miles were level, but the final three had a fall of about 80 feet. The buildings closer to the camera are shown as the Cromford Goods Wharf on the 1922 Ordnance Survey map. Almost in the centre of the main picture is the Leawood Pumphouse on the east side of Cromford Canal, with its distinctive chimney that is capped by cast iron. It is now Grade 2 listed and a Scheduled Ancient Monument. It was built in 1849 and houses a beam engine. The Wigwell Aqueduct, carrying the canal over the River Derwent, was constructed in the early 1790s. Cracks developed and William Jessop offered to repair it in 1793. The canal was closed in 1944, becoming the property of Derbyshire County Council in 1947. Today it is one of the county's attractions that date from the Industrial Revolution, alongside Arkwright's Cromford Mill. Beyond the canal is the railway, which used to connect London and Manchester but today only goes as far north as Matlock. "The road from Crich to Cromford is carried along the side of a steep hill, by gradual descent. It first passes through Holloway ...; it then sinks rapidly amongst the thick woods that border Lea Mill. Every step of this road varies the prospect, and the traveller is sometimes delighted with the beauty, and at others, elevated by the magnificent views it presents. The hills, the water, and the woods about Lea Mill form altogether one of the most picturesque seclusions in the vicinity of Matlock". Whilst we can't see Holloway in the main picture, the trees of Bow Wood and Coumbes Wood can be seen on the far hillside, reaching down to the long straight of the Lea Road. Once the road arrives at the former hat manufactory site (see below) it bends towards Lea Mills and the Lea Lead Works, which by this time had developed a large slag heap next to the works. Lea Wood is to the right of Lea Bridge, slightly blocking the view of Smedley's Mill. Before the major part of the Commissioners under a Commission of Bankrupt against James Daniel, late of Stockport... Hatter a Bankrupt at Guildhall, London, on the 26th day of April... in two lots: , at one o'clock, in two lots : LOT 1st, A Valuable Leasehold ESTATE, situate at Lea, in the parish of Matlock, in the county of Derby, consisting of a Hat-Manufactory, and three other Messuages or Tenements, lately erected, and let to respectable tenants at nett rents amounting to 110l. per. annum. The premises are held for a term of 200 years from the 6th July 1792, at a low ground rent. The hat manufactory at Lea had been built by Peter Nightingale in 1792 but the first tenant, a hat manufacturer from Stockport called James Daniel, went bankrupt (see newspaper advert above and photo below). By 1811 Thomas Saxon was running the factory and, according to the Rev. Peter Davies, employed about 120 hands at the factory adjoining the house. He was followed in 1820 by William Walker, who was born in Manchester in 1787. William Walker of Leawood was recorded in the 1851 census as employing 65 men and 20 women (or less) but it was the Crimean War that ultimately made his fortune. According to the Matlock hydropathist Jonas Brown, who in his earlier years had been employed at Lea (from 1835 onwards), he had "helped to make many a hundred soldiers' helmets at Lea Wood and it is quite true that the soldiers' "Yeoman's" used at Waterloo were made here. They were of a peculiar and not very handsome pattern and widened out upwards from the bottom. "Fashion altered the shape and later hats were made with narrower tops". Police hats were also made in two qualities, with the best ones more furred. The Leawood factory sent thousands of fur helmets to the Crimean battlefield. In 1861 Mr. Walker's occupation was that of Hat and Army Cap Manufacturer. The Matlock hats had been made from wool and hares' and rabbits' furs, but the trade was superseded by silk hats and the invention of hats made from stiffened calico. The Walkers stopped making hats but had made a fortune. When William Walker of Lea Wood died on 3 October 1868 he left "under £80,000" which today (2016) would be worth £6,657,684.21. Not super rich, but very well off. By 1890 the building had become a store for Mr. Lowe. It was offered for sale in 1893, with the lease having another 100 years to run. The Derby paper reported in 1923 that the factory was later used as a mineral water manufactory (John Else). It had by then been partly demolished and the stone used to build cottages nearby. The four storey stone built Hat Manufactory and surrounding buildings. "General View of Valley from Canal, High Peak". Published by Kingsway, No. S10664. Not used. Postcard in the collection of and provided by and © Susan Tomlinson. "History of Derbyshire" by David Peter Davies (1811), printed by S. Mason, Belper. The information about the canal is not included in the onsite transcripts of this book. "The Derwent Valley Mills and their Communities", published by The Derwent Valley Mills Partnership, County Hall, Matlock, Derbyshire, DE4 3AG, 2001. ISBN 0-9541940-0-4. Rodgers, Frank (2000) "More Curiosities of Derbyshire and the Peak District", pub. Derbyshire Countryside ISBN 0-85100-132-7. Bow, or Bough, Wood and Combes Wood are mentioned in the Wolley Manuscripts, Matlock. See Matlock Place Names Index. See Lea in Derbyshire Parishes 1811, Parishes L, which mentions Thomas Saxon and describes the buildings surrounding the hat manufactory. Derbyshire Parishes 1811 are transcribed excerpts from "History of Derbyshire" by David Peter Davies (1811). Thomas and William Saxon, presumably brothers, were beneficiaries under the 1799 Will of Hannah Burnham, widow of Jonathan of Shirland. Their relationship to Hannah is currently unknown. William Walker is listed in several early trade directories, including Glover's of 1827-8-9, Pigot's 1835 Directory, Slater's Directory 1850 and the Post Office Directory of Derbyshire & Nottinghamshire, 1855 (William Walker and Sons, Hat manufacturers). "Derbyshire Times", 22 February 1890. 1869 National Probate Calendars for William Walker of Lea Wood. An executor was his son William Walker. "Derby Daily Telegraph", 13 January 1893. A Noted Factory Offered for Sale. At a public auction at the Greyhound Hotel, Cromford the property offered for disposal. In 40 years it had gone from being in great demand to something of little value. "Derby Daily Telegraph", 15 August 1923.